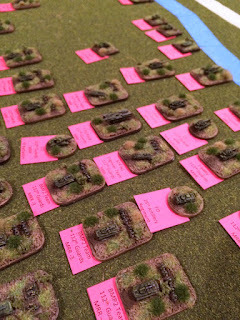 This week I hosted a game of "Modern Spearhead", the adapted version of Arty Contliffe's classic division level-WW2 rules. 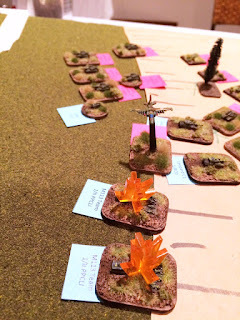 "Spearhead" is one of the great rule systems out there, and although I like to fuss with the rules from time to time, overall it is one of my favourite games and one of the best sets of rules ever done, in my opinion (of course, YMMV). In "Spearhead", each base or vehicle represents a platoon or troops or vehicles, a battery of guns etc. 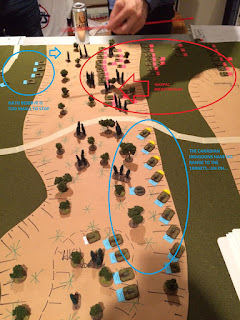 This is part of creating the right sense of abstraction in order to play a division-level command game. The players take the role of regiment and brigade commanders, and are not fussed with the tactical elements. 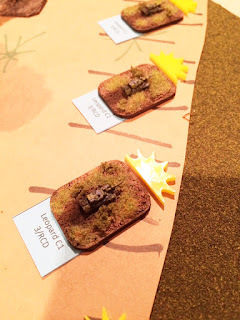 Contliffe's rules engine does this very well, and the key to success in a game of Spearhead is timing and planning, mixed of course with (you hope) some good fortune on the dice. I generally use my large (but old, and now really tired looking for the most part) 1/300 scale collection of figures to play "Spearhead" - whether WW2 or modern. But, as seen here and there on the blog, I have been getting more and more into the 1/600 scale sculpts from Oddzial Osmy (available easily from the delightful folks at Pico Armor). 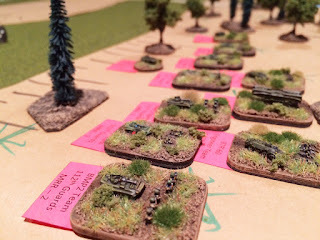 Here is an old post of those figures in action - I have been painting a few more to bulk up the collection, and we played another game this past week. 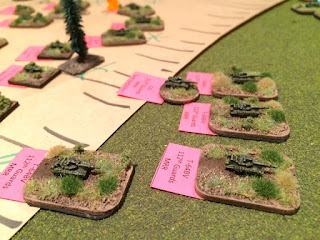 The scenario was a favourite setting of mine - Cold-War-gone hot, with the Canadians in CENTAG's III Corps put into action to try and prevent a Soviet breakthrough on the road to Frankfurt. Byron, Brian H and Dave V all came out for the game. Brian and Dave took command of the Soviets. They had a full BMP regiment at their disposal - designated the 112th Guards Motor Rifles - three battalions of BMP2 mounted crack troops, and an attached battalion of T-64BV tanks. The Regiment had its own attached 122mm SP artillery battalion. To bulk up further, the 112th received the 80th Independent Tank Battalion, equipped with T-72s. 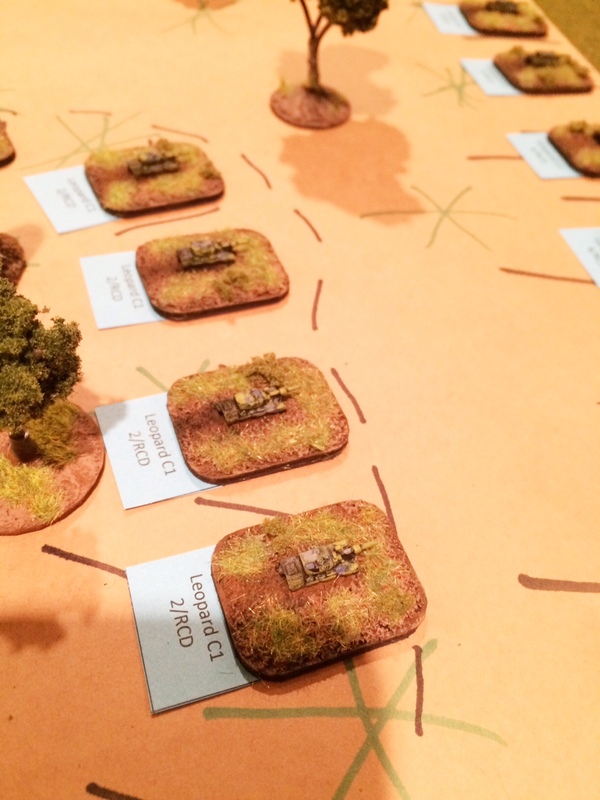 Off table there was further support from the division - another battalion of 122mm guns, and a further (scary!) battalion of 152mm guns! Air support in the form of Su-25 "Frogfoot" attack planes was also available. 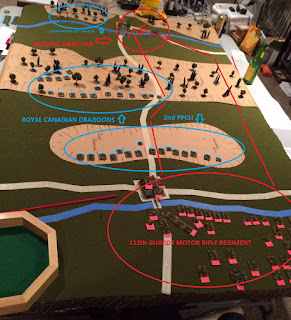 The Soviets had just crossed a small river, and their objective was to break through to the Canadians and capture the next town and river crossing. Time was of the essence, of course. NATO was on the run, and Frankfurt could be reached and CENTAG disemboweled - as long as the schedule was met!! Forward comrades! Dave and Brian crafted a fairly straightforward plan - sacrifice some units to overrun the forward deployed Canadians on the first ridge, and send the bulk of the regiment past the right flank so the Canadians on the second ridge would have difficulty engaging. Use the merciless amount of artillery to pound any resistance into dust! 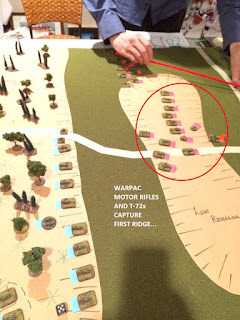 That's kind of how it unfolded - the Warpac forces broke out of the town and engaged 2PPCLI on the first ridge, taking heavy losses, but backed by horrible amounts of artillery. Soviet counter battery even located the Canadian gunners in RCHA, took out a battery and forced the survivors to relocate. Once 2PPCLI was crushed, the Soviets swept over the ridge, and encountered the guns of the Dragoons. The Leopards made short work of the Soviets who took the first ridge. Meanwhile, US air support showed up and started to put some hurt on the Russians. 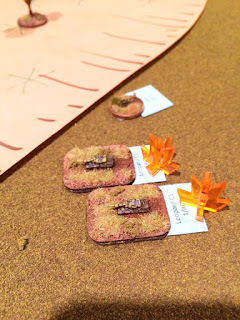 Byron's reserve came forward, but he could not get the dice god to allow the Dragoons to move in time! The Soviet flank thrust took a bloody nose from the small reserve (and more US air strikes), but Soviet artillery, and a visit from the Su-25s, blasted the Canadian reserves. 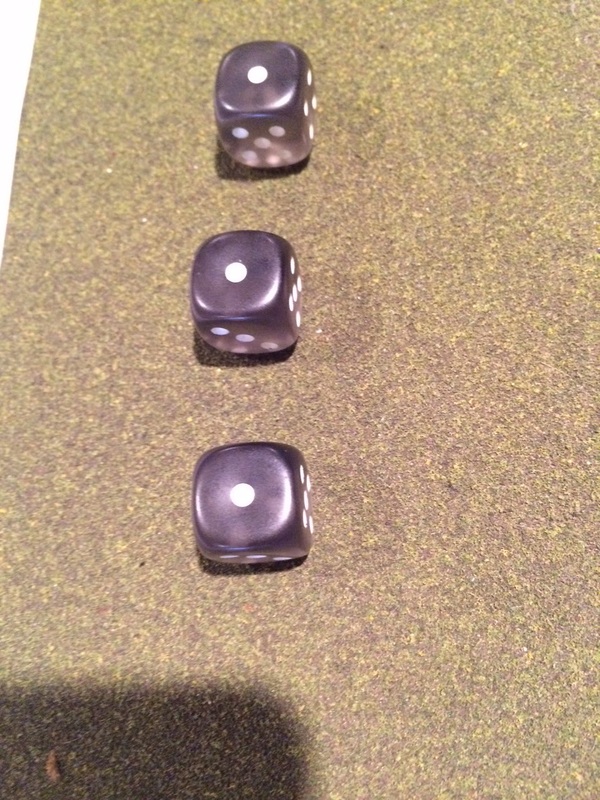 With two of their three elements broken, the Canadians were defeated. Soviet victory was achieved in 8 turns of hard fighting! Promotions for the Soviet Commanders! The Soviets had two battalions (a BMP unit and a T-72 unit) knocked out of the game, and two more (a second BMP unit and the T-64s) chewed up a bit, but their plan held and they managed to overwhelm the Canadians. 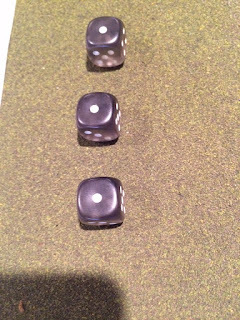 It was, however, a close-run thing - the pivotal issue was Byron's bad luck with his order dice - if he had been able to get the Royal Canadian Dragoons moving, they might have swept right into the flank of the Soviet advance over the second ridge...it could have gone either way. Soviet Motor Rifle units sweep the forested ridge! While it was a loss for the Canadians, and the poor lads of 2PPCLI took a drubbing, the Royal Canadian Dragoons were still actually in great combat shape, with three full squadrons and some attached support still ready to fight. 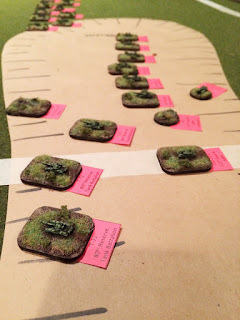 If and when the guys are up for another game of "Modern Spearhead", I think we'll have a scenario where these fellows are trying to cut their way out of the pocket they find themselves in and re-join the NATO lines. Thanks to Byron, Brian and Dave for coming out to play, and doing a great job playing the command roles in character! What a great game Greg! Too bad about Byron's order rolls as he might have chewed through that flank. I also really like your use of circles, arrows, etc for the post as it helps put things into perspective. Thanks for the game Greg, it was a lot of fun. I really like the spearhead rules as they are very fast and fluid, while still locking you into a plan ahead of time. Despite my inability to roll even average and get the units in the woods to move, I like that part of the game as it makes the setup and overall strategy of the fight seem more real. It removes a little bit of the "I can see and do everything exactly as I want, I am God" part of wargaming and puts some of the real world communication issues and fog of war issues into the game. While i would argue on behalf of 2VPs last stand needing to be represented more valiantly this was a Super fun read. I just picked up a copy of Sabre Squadron and am going to try it out for coy+ size games. Loving the micro armor right now though and am looking to play out some ultra modem.